Ships from and sold by Amazon US. New Expanded 8th edition with new photos and text. An epic study demonstrating the importance of whole food nutrition, and the degeneration and destruction that comes from a diet of processed foods. For nearly 10 years, Weston Price and his wife traveled around the world in search of the secret to health. Instead of looking at people afflicted with disease symptoms, this highly-respected dentist and dental researcher chose to focus on healthy individuals, and challenged himself to understand how they achieved such amazing health. Dr. Price traveled to hundreds of cities in a total of 14 different countries in his search to find healthy people. He investigated some of the most remote areas in the world. He observed perfect dental arches, minimal tooth decay, high immunity to tuberculosis and overall excellent health in those groups of people who ate their indigenous foods. He found when these people were introduced to modernized foods, such as white flour, white sugar, refined vegetable oils and canned goods, signs of degeneration quickly became quite evident. Dental caries, deformed jaw structures, crooked teeth, arthritis and a low immunity to tuberculosis became rampant amongst them. Dr. Price documented this ancestral wisdom including hundreds of photos in his book, Nutrition and Physical Degeneration. International products have separate terms, are sold from abroad and may differ from local products, including fit, age ratings, and language of product, labeling or instructions. Manufacturer warranty may not apply but you may have other rights under law. Learn more about Amazon Global Store. Only 1 left in stock (more on the way). Ships from and sold by Amazon AU. Dr. Price was a Cleveland dentist, who has been called the Charles Darwin of Nutrition. Searching for the causes of dental decay and physical degeneration he observed daily in his dental practice, he turned from test tubes and microscopes to study people with fine teeth the isolated primitives. 5.0 out of 5 starsThe proof of the pudding is in the eating! The proof of the pudding is in the eating! Either Dr. Price was right, or he wasn't, but every person can test his recommendations out for themselves - on themselves. Dr. Price studied many populations throughout the world on a search for the root cause of good health. He found it. The Weston A Price Foundation (WAPF) was founded upon his principles of eating for health; not for convenience, not for the cheapest meal a person could find, but for something that truly matters - one's own health. If you have health issues, particularly chronic disease which is the result of chronic inflammation, it can often be reversed by eating according to Dr. Price's observations and recommendations. If you don't have time to read this book, check out the Weston A Price (dot org) Foundation site - just google it, it will be at the top of the first search page. There is an article which is a mini-version of this book titled: Principles of Healthy Diets - just type it into the search bar on the right of the main page. Then read all 28 pages! I warn you, it’s crazy simple, and it’s not a diet. Here are the one page guidelines, called Dietary Guidelines, from the westonaprice site, my comments are in [brackets]. 1. Eat whole, natural foods. 2. Eat only foods that will spoil, but eat them before they do. 3. Eat naturally-raised meat including fish, seafood, poultry, beef, lamb, game, organ meats and eggs. 4. Eat whole, naturally-produced milk products from pasture-fed cows, preferably raw and/or fermented, such as whole yogurt, cultured butter, whole cheeses and fresh and sour cream. 5. Use only traditional fats and oils including butter and other animal fats [lard, tallow, goose, chicken], extra virgin olive oil, expeller expressed sesame and flax oil and the tropical oils—coconut and palm. 6. Eat fresh fruits and vegetables, preferably organic, in salads and soups, or lightly steamed. 7. Use whole grains and nuts that have been prepared by soaking, sprouting or sour leavening to neutralize phytic acid and other anti-nutrients. 8. Include enzyme-enhanced lacto-fermented vegetables, fruits, beverages and condiments in your diet on a regular basis. 9. Prepare homemade meat stocks from the bones of chicken, beef, lamb or fish and use liberally in soups and sauces. 10. Use herb teas and coffee substitutes in moderation. 11. Use filtered water for cooking and drinking. 12. Use unrefined Celtic sea salt and a variety of herbs and spices for food interest and appetite stimulation. 14. Use natural sweeteners in moderation, such as raw honey, maple syrup, molasses, dehydrated cane sugar juice [rapadura, sucanat (sugar cane natural) date sugar (ground dates)] and stevia powder. 17. Use only natural supplements. 18. Get plenty of sleep, exercise and natural light. 1. Don't eat commercially processed foods such as cookies, cakes, crackers, TV dinners, soft drinks, packaged sauce mixes, etc. 2. Avoid all refined sweeteners such as sugar, dextrose, glucose and high fructose corn syrup. 3. Avoid white flour, white flour products and white rice. 4. Avoid all hydrogenated or partially hydrogenated fats and oils. 5. Avoid all vegetable oils made from soy, corn, safflower, canola or cottonseed. 6. Do not use polyunsaturated oils for cooking, sauteing or baking. 8. Do not practice veganism; animal products provide vital nutrients not found in plant foods. 9. Avoid products containing protein powders. 10. Avoid pasteurized milk; do not consume lowfat milk, skim milk, powdered milk or imitation milk products. 11. Avoid battery-produced eggs and factory-farmed meats. 12. Avoid highly processed luncheon meats and sausage containing MSG and other additives. 13. Avoid rancid and improperly prepared seeds, nuts and grains found in granolas, quick rise breads and extruded breakfast cereals, as they block mineral absorption and cause intestinal distress. 17. Avoid aluminum-containing foods such as commercial salt, baking powder and antacids. Do not use aluminum cookware or aluminum-containing deodorants. 18. Do not drink fluoridated water. 19. Avoid synthetic vitamins and foods containing them. 20. Do not drink distilled liquors. The research and rationale for eating for health are in this book, but the guidelines are simple and easy. You very likely don’t need a doctor or a therapist, you just need to eat real food, and ignore the fake foods and fad diets of the day. It is our processed, sugar laden, non-nutritive, chemically loaded modern diet that is at the root of much of our modern diseases. It can be reversed and you can do it yourself. Read this book, save your own health and life. I did, my husbands heart disease reversed, it works. 387 people found this helpful. 5.0 out of 5 starsUnprecedented and timely; merits re-reading. In 2005, I read a book that changed everything I thought I knew about nutrition - for all time; it is THE book of causative factors. 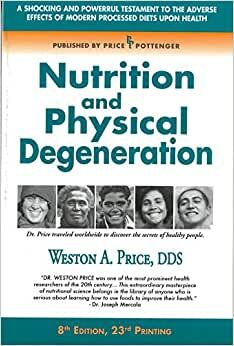 This past week, 9 years later, I decided, prompted by some discussions online and here, to re-read it: "Nutrition and Physical Degeneration," by Weston A. Price. It's even more timely and prescient than ever. I was just as compelled then as now - more so, perhaps, after 10 years of reading and research of my own. I easily read 500 pages in 4 nights. Price was a dentist who graduated from the University of Michigan dental school in 1893. As he got into the first two decades of his practice in the 20th century, he became increasingly alarmed at people with bad teeth, poorly formed palates, cavities, and deformations of the jaw - and with that, serious health problems. He and his wife, beginning in 1929-30, traveled around the world to 14 different countries to find how the health, elsewhere, corresponded with mainly modern Americans. He visited isolated and respectively more modernized cultures in a Swiss village, Gaelics in the Islands of the Outer Hebrides, Eskimos, North American Indians, Melanesians, Polynesians, numerous African tribes, Australian Aborigines, Torres Strait Islanders, New Zealand Maori, and the Peruvian Indians. As well as studying the kept skulls of ancient Peruvians - nearly perfect palates and teeth. Bottom line: he investigated these peoples, who subsisted of their native "wild" foods - variably, meat, blood, butter, organ meats, milk, fish, rye, oats, some vegetables - and observed in them perfect dental arches, very rare tooth decay and cavities, and most of all, immunity to tuberculosis; their health, as well as their physiques, was found to be outstanding. However, in those groups, where certain segments obtained "modern foods of commerce" - white flour, sugar, jams, vegetable fats, canned goods - their health suffered, tuberculosis became rampant, as well as serious birth defects, cavities, deformed jaws, crooked teeth, and a host of other degenerative conditions. There are hundreds of photos throughout, and the difference between those who ate their native foods, and those who had manufactured foods, is truly, jaw-dropping shocking. Price documented his findings rigorously, thoroughly, with percentages and averages noted throughout. He also conducted numerous tests, curing several people of their health problems just by a change in food. The tests on vitamin A, D, butter, and minerals reveal some crucial findings and results. Animals with no vitamin A were born blind, or disfigured. There are several X-rays and photos that show the outcome of his tests. He notes conditions of soils, contents and values of whole grains, grasses and how they affect the final outcome - results of the consumption of the food in humans and animals. What it all boils down to is chemistry. The closer a food is to its natural origins and source, the better the health. The further away from its origins it is, processing, poor nutrients in growth cycles, denaturing, the worse the effect. In some of these cultures, no two young people were allowed to procreate unless they had undergone 6 months of concentrated nutrition to maximize the health of the conceived child. Price makes constant note of the "native wisdom" that had been passed down from generation to generation. He presents not just a few token cases but hundreds of them, across several thousands of miles - and it is startling how consistent the findings are from place to place. Though it was written in the 1930s, it is nonetheless eerily prophetic of the ominous trends that punctuate modern technology, namely the changing nature of how humans and animals eat. There is a "Twilight Zone" sense of foreboding as Dr. Price's research and findings unfold, chapter after chapter. What this book amounts to is a convincing, virtual warning on what is happening to the planet, to its food in all forms, and the humans and animals that inhabit it. I have no reservations about saying that this may be the most crucial piece of work on nutrition to ever have been written. This book is a spectacular read; I can't even begin to cover the astonishing breadth and scope of it. It is also controversial: a lot of quacks and grain and vegetarian fanatics have attacked this book, but, as it turns out, every one of Price's early findings are increasingly gaining merit as a lot of myths are being refuted. Though it does deal primarily with Dr. Price's research, findings and discoveries on nutrition and physical degeneration, there are so many rewards otherwise. This is a first-rate travelogue, superb cultural anthropological study, and an impressively thorough analysis of human behaviors. Moreover, Price is a wonderful writer, matter-of-factly genteel, dispassionate and duly concerned all at once. There is a compassionate, keen kindness in his own being, and the generosity of spirit in wanting to do for the common good is evident throughout. 200 people found this helpful.